Click to enlarge. Top row left: front view. Right: side view. Bottom row left: sword belt. 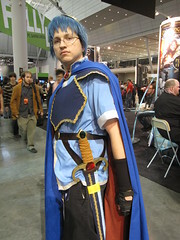 Right: at Pax East 2011. 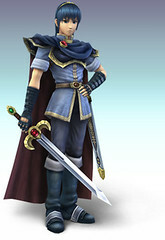 Fabric and Materials: Cotton broadcloth of various colors for the cape, shirt, boot covers, and armor covering. Plastic canvas for the armor base. Felt for the sword scabbard. Vinyl straps for the sword belt. Gold synthetic trim. Found objects for the rest. Notes: Made winter/spring 2011, together with Mike, for Mike. 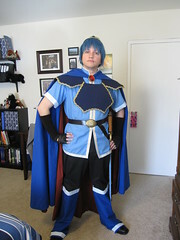 I sewed the cape, shirt, and boot covers. The boot covers were sewn to dark black pants. 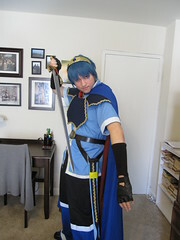 I constructed the chest armor, sword belt/scabbard, and crown. I made the long gloves by attaching the leg part of a pair of tube socks to store-bought fingerless work gloves. Mike and I together painted the sword, and I wrapped its handle with leather jewelry cord. We glued plastic gems to the crown, to the pin for the cape, and to the sword. 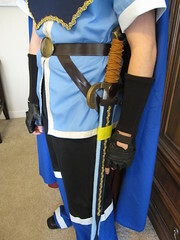 Mike collected most of the materials, such as sourcing the plastic gems, sword, buckles, and vinyl straps.